July 13, 2017 — John M. Buol Jr.
Allied Machine & Engineering has expanded its AccuPort 432 and AccuThread 856 program to include more than 120 kits for manufacturing hydraulic ports and manifolds. The kits are now available to meet SAE J1926; ISO I6149; John Deere G1731; and SAE AS5202 (aerospace standard/Mil-Spec) specifications. Contained in each kit is everything necessary to cut and finish the port, including an AccuPort 432 Port Contour Cutter, T-A or GEN2 T-A pilot insert(s), port form inserts, and an AccuThread 856 threadmill. Kits have a 5 day lead time if not in stock. The J1926 and I6149 specification kits are ideal for heavy equipment applications, and are available in both metric and imperial shanks for both ferrous and non-ferrous applications. The G1731 specification with a metric shank is designed for cast iron applications, and the AS5202 comes with an imperial shank for both ferrous and non-ferrous applications. 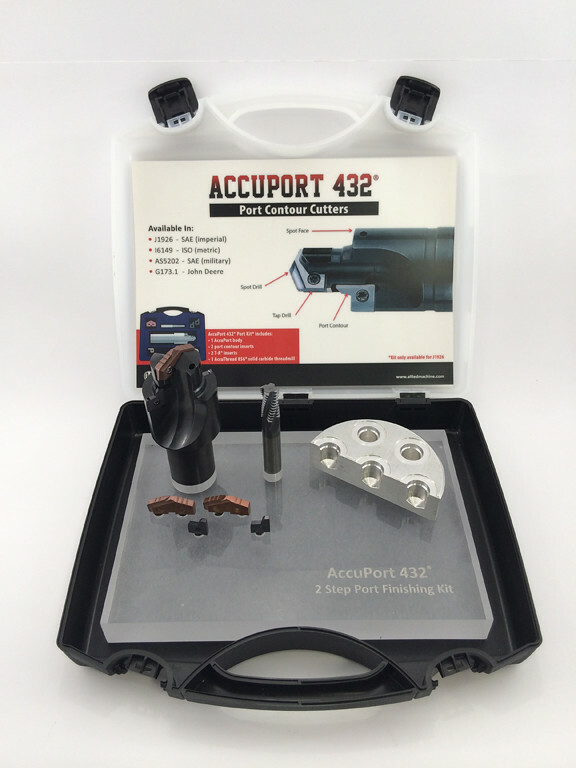 The AccuPort 432 Port Contour Cutters enable users to drill and finish port forms in one operation. Produced to strict manufacturing tolerances that meet each specification’s finish tolerances, the patented design is ideal for ports and stud ends with straight threads and o-ring sealing. The AccuPort 432 eliminates the need for pre-drilling and allows for efficient set-up and production time. The replaceable insert design eliminates regrinding and resetting. The AccuThread 856 provides superior thread forms when compared to other thread mills and taps. Allied’s proprietary AM210® coating provides a 25-50 percent increase in tool life over other competitive options. With a thicker core and helical flute, AccuThread 856 solid carbide threadmills offer increased strength and rigidity when cutting forces are applied. Standard cutting lengths permit multiple applications without special thread mills.